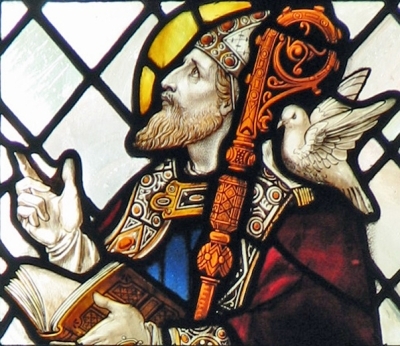 Today is one of my favorite feast days: The Feast of St. David of Wales! There are many wonderful stories about Saint David. I decided today to use an element from one of the many stories about St. David to bring wet on wet watercolor painting to our first grade daughter. There seems to be a lot of confusion and mystery regarding wet on wet painting for those families new to Waldorf. Watercolor painting, in and of itself, has been around for quite some time – think of brush painting from Asia, and the watercolors of the German Renaissance Master Albrecht Durer. Waldorf Education has a beautiful of approaching watercolor painting for children in the kindergarten and the grades. So, today I had heavy watercolor paper soaking in a tray of water whilst I told some brief stories about St. David, including how he went into Wales to spread the message of the Gospel, how the monastery he founded was very simple where the monks pulled the ploughs for sowing the fields, how he and his monks ate no meat, and how St. David was called the “waterman” not only because he would only drink water but because he would often pray submerged up to his neck in cold water in those Welsh lakes. I also talked about the miracle of the ground lifting him up so people could hear his message. Then, to lead up to our painting, we ended with the story of the battle between the Welsh and the invading Saxons. Legend has it that the Welsh were losing until St. David pointed out that the dress of the two sides was so similar they could not be told apart in battle. He suggested each of the Welsh put a leek in their hat or dress, and the Welsh went on to win the battle. When a Welsh leek flowers, it looks like a daffodil, so we worked together to create the beautiful colors of the daffodil in our painting. First we painted our whole page yellow. Even the sky moved closer in to see the daffodil, but dared not to get too close to touch the daffodil. The sky did not want to mar the daffodil’s radiant springtime beauty! (Paint blue creeping in at the edges, round and round on the page, circling in, until a patch of yellow daffodil is still present). And all the sky, and all the meadow, rejoiced in the daffodil’s beautiful light. (If you look carefully at this painting, you can see the darker blue on the outer border, green like meadow as the blue and yellow mixed, with a yellow center as a daffodil). The main thing to wet on wet painting is to just get the supplies and paint! Paint yourself first and then bring it to your children! They will thank you! This entry was posted in First Grade, Homeschooling, Resources, Second Grade by Carrie. Bookmark the permalink.